Arvand is the name of robots specially designed and constructed by sharif CE team for playing soccer according to RoboCup rules and regulations for the middle size robots. Two different types of robots are made, players and the goal keeper. A player robot consists of three main parts: mechanics (motion mechanism and kicker), hardware (image acquisition, processing unit and control unit) and software (image processing, wireless communication, motion control and decision making). The motion mechanism is based on two drive unit, two steer units and a castor wheel. We designed a special control board which uses two microcontrollers to carry out the software system decisions and transfers them to the robot mechanical parts. The software system written in C++ performs real time image processing and object recognition. Playing algorithms are based on deterministic methods. The goal keeper has a different moving mechanism, a kicker like that of player robots and a fast moving arm. Its other parts are basically the same as player robots. We have constructed 3 player robots and one goal keeper. 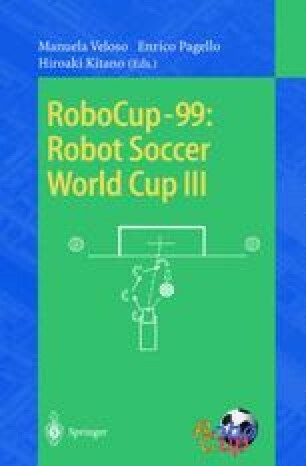 These robots showed a high performance in Robocup-99: became champion.